10 USA Visa Denial Rumors - Is it a Myth or Fact for USA Visa Application of Philippines Passport Holders?? As if applying for a US Visa isn’t a nightmare enough, we often hear things from our neighbors and friends which make it even worse! Kesyo yung friend daw nya na buong pamilya nag apply e nareject tapos gumastos ng 35,000, yung kapitbahay ng kaklase ni Jun Jun na reject dahil kulang ang pera sa bangko, mag hanap ka daw ng fixer at siguradong approved yan, at marami pang iba! Beware, not all chismis are true and not all are false either. Here are some of them and what here’s what I think if it’s true or just plain false news! To get the USA Visa, you only need to pay $160 directly to the USA visa application website.. Wala ng iba! Usually if you’ll hire a travel agency, all they do is fill up the form and make an appointment for you.. Wala ng iba! I’ve heard they are even charging 100,000 pesos or more! Don’t spend that money.. It’s not necessary! Everything is online na - online filling up the application, online scheduling for visa interview but you need to attend the interview kasi for your fingerprint, photo and also to speak to the consul. Yes, you need to do it personally and walang decision-making power ang travel agency. If you're still confused, we have a lot of free articles to guide you on this blog or you can check the PREMIUM USA Visa Pack to get my video recordings guiding you with the process and how to answer during the interview. Document requirements ay not necessary but it’s better if you bring them with you during your interview.. Big savings is not important but a consistent stream of income would help with your “rootedness” in the country! I know people who got approved with minimum salary or just receiving allowances or remittances from their partners etc… What’s the most important? NEVER LIE but make sure you’re prepared to ANSWER during the Consul interview process.. If you need a coach or someone to teach you how to answer these personalized questions according to your situation (esp if you’re young & single or with an American boyfriend/ husband) and still don’t know what to do then hire me as your Travel Mentor - you can read my details here. I’ve got my USA visa when I was 24 years old while backpacking (no employment), single that time and also has a pending immigrant petition from my Aunt. It’s 2018 na.. Most of the rumors are in the 80’s so read our Visa Application Articles as well to guide you about visa rejection (and what to do), what to do with show money and other visa-related tips for Philippines passport holders! Anyway, read below the 10 USA Visa application RUMORS -- is it a MYTH or FACT? Tell me what you think in the comment below! # 1: THEY SAY THAT ONCE MY VISA IS REJECTED, I’LL NEVER STAND THE CHANCE TO GET A VISA ANYMORE. The Possible Reasons for Denial: The Consuls in Manila wouldn’t really tell you the reason behind the rejection. They would just say “I’m sorry I cannot give you your visa right now” and that’s it. But certainly, something went wrong with your visa application form which they verified during your interview or they cannot ascertain your financial capability and intention to leave the US Territory when required. Maybe there’s something wrong with your application form. You have to scrutinize it at eto ang panahong mag nilay-nilay kung saan ka nagkamali! The Available Remedy: You can re-apply at anytime. This is the unli chance that I’m talking about. But Remember: There should be a "significant change" on your situation on your next visa application, whether it’s family, economic, or social. Eg. You didn’t have a source of income then, but yayamanin kana ngayon because may business ka na or employed kana, o baka nanalo ka sa lotto! Or maybe you were single when you first applied, but now you’re married with a man who has a good paying job. Ganyan. If there’s none, then there’s a very slim chance that the Consul will change his mind. # 2: THEY SAY THAT IF I DON’T HAVE ANY VALUABLE PROPERTIES, MY VISA WILL MOST LIKELY BE REJECTED. #3: I SUBMITTED FALSE DOCUMENTS ON MY LAST APPLICATION AND THEY FOUND OUT ABOUT IT. THEY SAY I WOULD PROBABLY NEVER GET MY US VISA. FACT! Submitting a Falsified Document for your US Visa application is a grave misconduct that it isn’t tolerated at all. If they can’t trust you with the truth on a simple document, then how can they say that you would never violate the terms of your visa once granted? Submitting false document only shows utmost desperation and tainted intent. Once found out by the Consuls (which is most likely), visa will be rejected outright and can cause you to be blacklisted. #4: I HAVE A CRIME RECORD. THEY SAY MY VISA WILL NEVER GET APPROVED. SOMEWHAT FACT! Their decision will depend primarily on the crime you committed and the gravity of the offense as well as your participation. If it’s just a minor offense or not convicted like theft, then you MAY still have the chance. But if it’s murder or homicide and your convicted then you won't be allowed to enter the country. However, in all cases, expect some intense visa interview and careful scrutiny of your documents by the Consul. 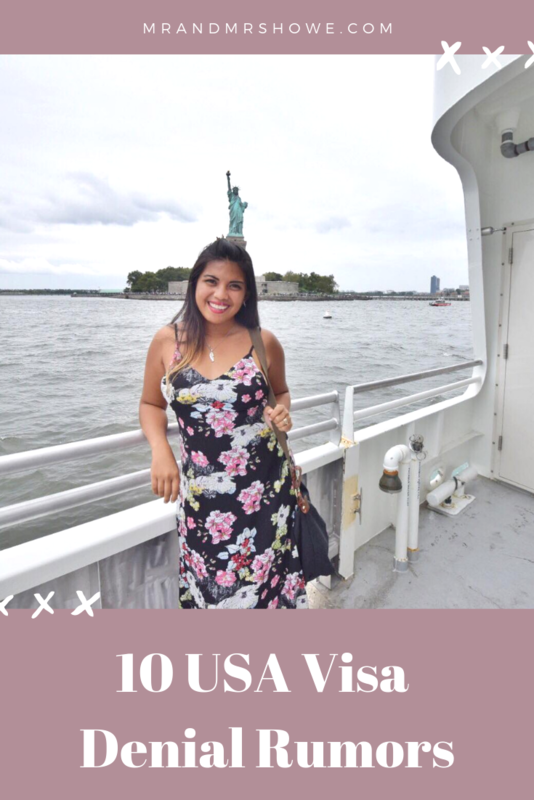 According to this blog, these are crimes that will make you Inadmissible to the U.S.
Below is a very basic list of crimes that will make you inadmissible to the Unites States. This list is by no means complete. You should also note that not all of these crimes require an actual conviction in court to make the applicant inadmissible. Crimes involving moral turpitude. This includes any attempt or conspiracy to commit such a crime. It excludes crimes committed when the person was under the age of 18 years, so long as the person was released from jail more than five years before applying for a visa or other immigration benefit. It also excludes crimes for which the maximum penalty did not exceed one year in prison and the person was not, in fact, sentenced to more than six months in prison. See the more complete list of crimes of moral turpitude below. A controlled substance violation according to the laws and regulations of any country. This includes trafficking and any conspiracy to commit such a crime. This includes a single offense of simple possession for a small amount of THC residue or for “drug paraphernalia.” It also includes the spouse, son, or daughter of the inadmissible applicant if that person has, within the last five years, received any financial or other benefit from the illicit activities, and knew or reasonably should have known where the money or benefit came from. No actual conviction is required to trigger this inadmissibility. Convictions for two or more crimes for which the prison sentences totaled at least five years. It does not matter whether the convictions came from a single trial or whether or not the offenses arose from a single scheme of misconduct. Almost anything that has to do with money laundering. Do not even attempt to enter the U.S. if you have been previously deported without a proper visa. This is considered a serious felony under U.S. law and can result in extended jail time. #5: SOME OF MY FAMILY MEMBERS HAVE HISTORY OF ILLEGAL IMMIGRATION IN THE US. THEY SAY THIS WILL GREATLY AFFECT MY VISA APPLICATION. FACT! Illegal Immigration is greatly frowned upon by any country, most especially the United States of America. Having a history of illegal immigration will be taken against you and would give you a very tiny chance of visa approval especially if it’s an immediate family member. If it’s a far relative let’s say 4th degree, then I think you’ll be fine (don’t take my word for it though but you can always try). #6: I’M A WOMAN, YOUNG AND SINGLE. THEY SAY MY VISA WILL MOST LIKELY BE REJECTED. Do you need proof? Me! I got my USA Visa in 2015 and I was only 26 years old but I had a boyfriend (still counted as not married!). Also, I have a lot of coaching clients and friends who got their visa when they're young, single but NOT broke. #7: THEY CAUGHT ME LYING ON MY INTERVIEW. THEY SAY MY VISA WILL MOST LIKELY BE REJECTED ON MY NEXT VISA APPLICATION. FACT! During the interview, they expect you to answer the questions truthfully. Consuls are trained to know if what you’re saying is true or not and they take note of all your answers. You’ll notice them typing a lot during the entire visa interview. I remember this guy in front of me during the visa interview. He was asked if he had any plans of studying in the US to which he said no. The consul replied: “I’m sorry. I cannot give you your visa. In your previous interview, you said that you’re planning to study in the US”. That’s just crazy and I don’t know what he’s gonna be asked if he applies again. So if I were you, don’t even attempt to lie on your visa interview. Once you’re caught, you’ll be in trouble. #8: I DON’T HAVE A 6-DIGIT IN MY BANK ACCOUNT, THEY SAY MY VISA WILL MOST LIKELY BE DENIED. MYTH! Having a 6-digit in your bank account isn’t a requirement. As long as you have enough funds to show that you are capable of financing your supposed trip to the US, then it will be fine. Aware sila sa fund transfer scheme na eksena natin kaya they don’t rely on the Bank Certificate and Bank Statement that much! I know this girl who applied when she was still studying. She only has 50,000 Pesos in her bank account that time and a few passport stamps. Ayun she was granted a 10-year multiple entry visa! The consul didn’t even ask any documents from her. It’s really up to your application form and how you answer the consul’s questions that matter. Kelangan match yung status mo sa life sa current savings mo.. If you're only earning 18,000 pesos per month then you have 800,000 pesos savings na you saved in 6 months.. how can you explain that?? Also, for you na in your 20s na Pinoys, no one would expect na you already own a condominium or house and lot unless you inherited it or talagang mayaman na pamilya ka lang! So don't worry about not having properties! #9: THEY SAY GETTING A FIXER WILL DEFINITELY MAKE ME GET MY VISA. MYTH! There is NO FIXER in the US Embassy and it’s absolutely not allowed. Hindi yan parang LTO na pababa ka pa lang ng taxi na sinasakyan mo e may sasalubong na agad sayo. Don’t even try getting one! If someone approaches you and promises you visa approval for a fee, lumayo layo kana. SCAMMER YANG KAUSAP MO!! #10 THEY SAY THAT I WON’T GET APPROVED IF I HAVE A PENDING IMMIGRANT PETITION? MYTH! I got my USA Tourist visa in 2015 while my family has a pending petition from my aunt that was filed in 1995! Antagal na, this was the reason why my father and family was hesitant to apply for the visa kasi kala nila automatic rejected. All I had to do during the interview, I told them that I have pending petition and all I want is to travel this trip and why would I waste and "ruin" the entire process just to be an illegal immigrant if konting kembot na lang approved na yung petition namin? That’s all for now! If you need any more help, don’t hesitate to avail of my Coaching Services. Together, we can go through your documents and application form. We can do a mock interview too! I’ll guide you on how to answer the Consul interview questions! :) (I don’t promise visa approval because hindi ako scammer and I’m a Travel MENTOR/ COACH... haha! What I can promise is I’ll do my best to help you nail the next visa interview). Read the testimonials of my previous clients on our my services page. Liveaboard Life Day 152: What happened to the social life and adventure? Ha!